Shaking the foundations: What is the nature of a purchaser’s interest before completion? Have small business rights been adequately recognised in the Harper Report? This article discusses the background, development and significance of the Magna Carta in the century after it was accepted by King John in June, 1215. The article also considers the importance of the companion Forest Charter, which elaborated the provisions in the original Magna Carta for regulation of the Royal Forests. Misleading and deceptive conduct cases decided by the Supreme Court of Victoria usefully illustrate the principles stated by the High Court. 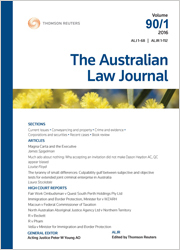 For the pdf version of the table of contents, click here: ALJ Vol 89 No 6 Contents.